Home | Cleanroom Supplies | Clean Room Environment Tacky Mats | Valutek, VT3645P30L Cleanroom Adhesive Sticky Mat - 36" X 45"
Valutek, VT3645P30L Cleanroom Adhesive Sticky Mat - 36" X 45"
Valutek multi-layered low density polyethylene adhesive mats can effectively capture dirt and dust from foot-traffic and equipment wheels before they enter a cleanroom or controlled environment. Each removable layer of Valutek adhesive mats has a specially developed adhesive coating designed to provide an effective means of reducing contamination by trapping and preventing the transfer of particles. 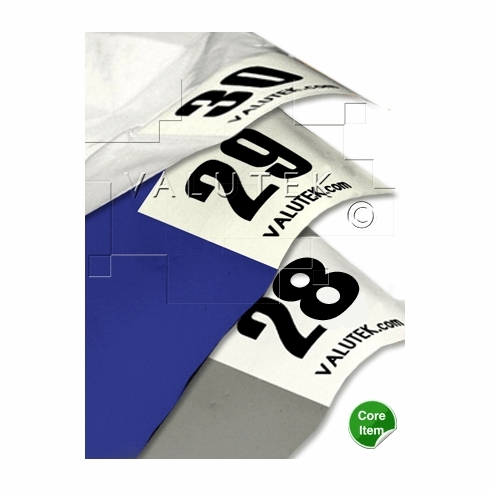 Valutek provides mats that are suitable for Macrotek, Microtek and Nanotek applications. The mats are ideal for a wide range of applications including cleanroom entrances, gowning rooms, laboratories or work stations that require high levels of contamination control. Adhesive mats are widely used in a variety of industries including semiconductor, biotechnology, medical device, pharmaceutical, aerospace, automotive and construction. This item is sold by the Case.